I’ve been working on this list for a VERY long time. In recent conversation with my CC tutor buddies though, I realized that this won’t be of much help to tutors and parents if I never move it out of my “drafts” folder and get it published! So here it is. These are some fun ways to review Classical Conversations material (or really any material for that matter) with your class or with your own students at home. It is not an exhaustive list by any means, but these were what I’ve regularly used, seen in use, and enjoyed with my students. I’m sure there are lots more fantastic ideas on CC Connected, so don’t forget to check there as well! First a few tips… When I was tutoring I always liked to pair or team my students up to answer review questions because it really ISN’T a competition. It’s more about letting the students go through the material again, whether they’re reciting it or simply hearing it; every exposure counts. By teaming or partnering students up, it’s less likely anyone will feel disappointed if they can’t think of the answer and you’ll be more likely to have attentive students since they will be busy helping one another. For most of these games I just used my Foundations Guide to choose questions. I’d make a light pencil mark next to the ones I already asked if I started to get confused, but usually I was able to keep track by focusing on either one week at a time or one subject at a time. As I set up any game I often had the class sing the Timeline Song together and then I’d omit that subject from the game. So we’d only go through: Grammar, Math, Science, History Sentence, Geography, and Latin during the game play. You can nearly change any game into a review game by simply having students answer a review question before their turn. You just need to be diligent in selecting games that require little play time, so each student’s turn isn’t so long that it squanders the review time. We actually use this other brand like Kerplunk but called Tumble. It works just as well. Kerplunk – Students answer a review question before pulling a stick from the Kerplunk stand. Candyland – My girls love this one in the classroom AND at home. It works best when the class is split into 2-4 groups. I assign each subject a color and usually omit the Timeline when playing. Then it works out just right to use the solid colors for each subject. There are special “Candy” spaces too, that you could use as free cards and students could move to that space without answering a review question. Alternately, you could allow students to choose a subject when they draw those cards. I have heard of some tutors who use their color-coded review cards for this game and the colors coorespond with the game cards, too. Makes me want to buy those cards… lol! We use Hot Wheels to practice high frequency words at home too. 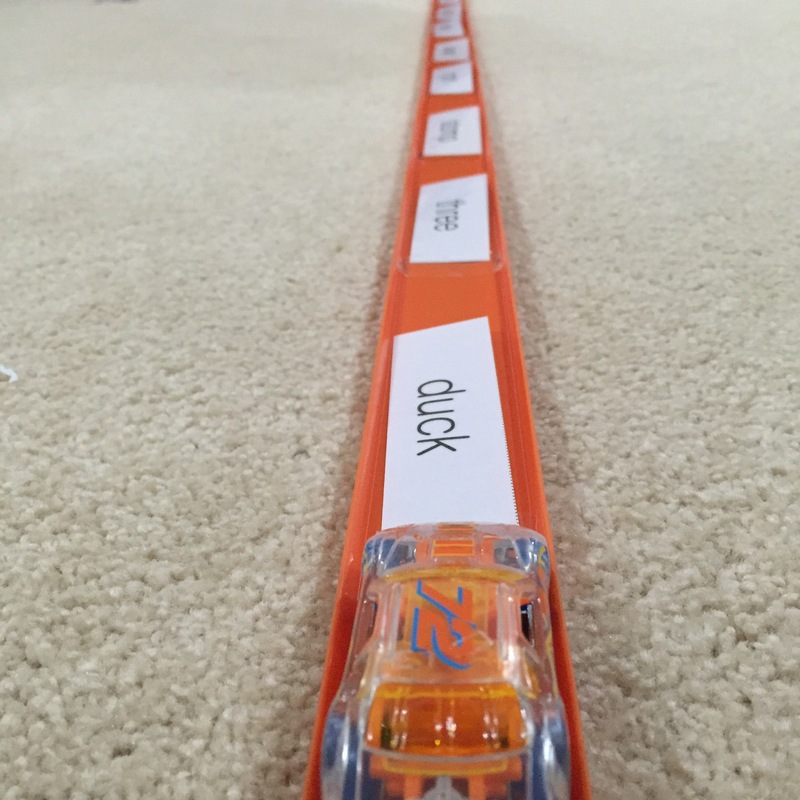 Hot Wheels tracks – I had my students race cars down a track after answering a review question. I always split my class into two groups for this one. There are a number of different ways to utilize Hot Wheels for review. My class placed tape marks on the floor with a point system and we kept score according to how far the cars went. Another option would be to set up tracks side by side and have students race after answering a question. Students could BUILD a track piece by piece, earning a segment with each review item. At the end of review time they could send their cars down the track. Or the easiest way is to just let them release a car down the track after each turn. I received a HUGE box of tracks and cars for free from Hot Wheels through their Speedometry program. Keep your eyes peeled on their website so once their classroom kits are available again your CC community can snag some too! Monster Draw – Students take turns drawing a monster body part on a marker board after a review question. We use this one at home often too. It is simple and requires no more material than you should already have on-hand at CC: a marker board and a dry erase marker. LEGO Game – I found this on Homeschoolingonadime.com and my students loved it! I printed two, split class into 4 groups of two (2 teams of 2 at each board), and asked a parent to take one set while I took another. We used MathLink Cubes in my class because I have a bazillion of those and I didn’t want to risk losing any of my daughters’ LEGOs. They worked just fine and the kids loved seeing how tall their stack could grow! I imagine if they each brought in a minifig you could provide some basic LEGO bricks and it would be much more fun than my plain MathLink Cubes. Jenga – Answer a question correctly, pull a Jenga piece out! Make sure you have your students sit AWAY from the table with the Jenga pieces on it, or else it might be toppled too many times. I had my students sing the Timeline Song whenever I was rebuilding it after a fall. Jenga in my classroom last year. Roll the Dice – Number the subjects 1-6 and roll one die to choose a subject. Roll again or use a second die to determine points. Puzzle time – In teams of two, students answer review questions then either select or are given a puzzle piece to place. You can use almost any puzzle, keeping in mind the number of pieces that need to be placed to complete it. Maybe choose a big puzzle and work on it for a few weeks, or choose a couple small ones that can be completed multiple times during review. This game is also easily tied into Geography or many other subjects simply by puzzle choice. I used a world map puzzle during Cycle 1 for my students and it was well received, a little challenging, and great review of the various countries we had learned. That said, I used a T.S. Shure world map puzzle. It’s super pricey on Amazon- don’t buy it from there! I found it a Costco for only $25. It’s nice because it is BIG, detailed, and magnetic, but it’s not the best, as the pieces frequently slide down when it’s in an upright position. GeoToys is a brand we’ve enjoyed using for their GeoBingo USA game and I found out they make various geographic puzzles too, including world, regional, and country puzzles. If I had a choice and could go back in time, haha, I’d probably go for the GeoToy brand now. They have individual continents, which could be really fun to add to Geography memory work in general as well. My kids loved popsicle stick review! Popsicle Sticks – There are a few different varieties of popsicle stick review. I wrote a few different activities on mine and had the kids draw one from a cup. We’d do the activity written on the stick while reciting a piece of memory work. It was a great way to get extra energy out. Another option is to simply write the week number on some sticks and place them in one cup, then write the subjects on another set of sticks in a second cup. Have a student choose a weekly stick to select the week you’ll be working on, then students can pull the subject sticks out one by one, reciting the memory work as they go. It works the same reversed, choose a subject, then select the week. You can also add the activity sticks if you’d like to make it a bit MORE fun. Tower Build – Using any kind of blocks, students add a block to create a tower as they answer review questions. Keep count and see how high you can make your tower before it falls. Try it in teams with two different towers to create a little extra friendly competition. Nerf Target Practice – This game is lots of fun and involves very few supplies that an average family doesn’t already have. Draw a bullseye on your whiteboard. Load some kind of Nerf gun; Suction cup darts make it easier to keep track of score, but may or may not stick well to your board. Most of the kids don’t mind skipping the score keeping anyway and just enjoy the target practice. Have the students stand in line and recite memory work for their opportunity to shoot. If you’re not comfortable with Nerf guns, you could also try their crossbows, which kids really seem to like. But really, any form of soft projectile would probably work! I’m sure there are lots more great ideas out there. Share it with any tutors you know who need some fresh ideas. I’ll keep the list going. Please leave a comment if you have a fun game you’d like me to add! And let me know if you try any of these in your classroom or at home with success. I want to hear about it! Please note that some links on my blog are affiliate links. It costs you nothing to use them, yet if you choose to make purchases through them, I may receive a small commission which helps keep our homeschool affordable. Mahalo (thank you) for your understanding.